It was an uneasy night at our camp on the outskirts of Lusaka. The energetic lodge dogs kept us awake into the wee hours of the morning barking and chasing zebra. 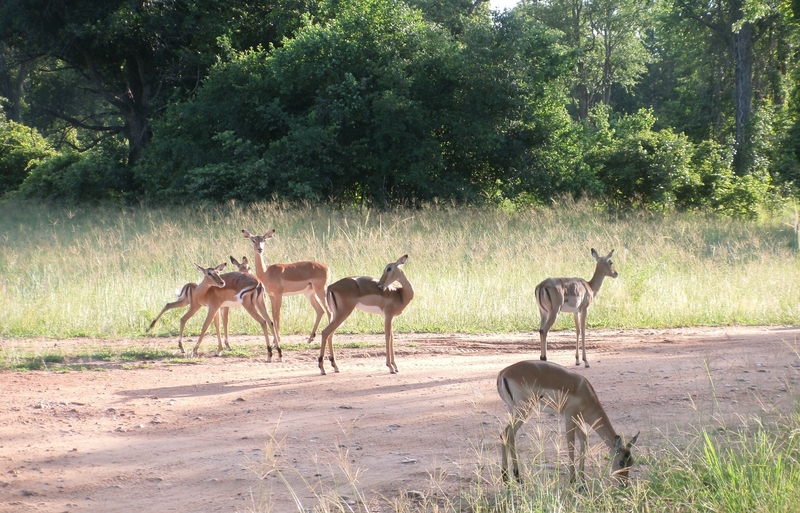 Eager to escape the commotion, we departed early for South Luangwa National Park. On the way we visited a local textile project – Tribal Textiles. 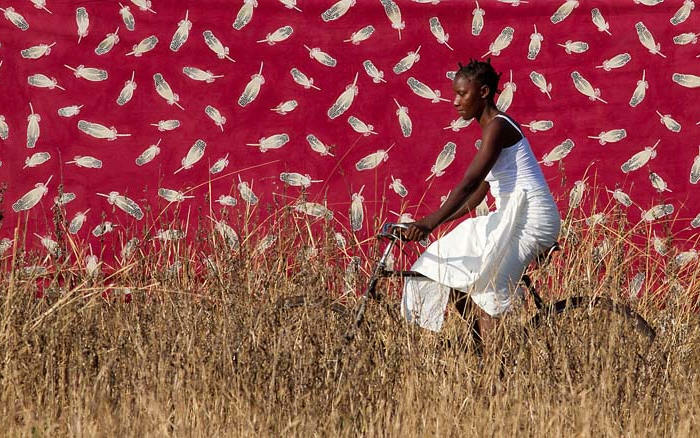 The unique, elegant textiles they produce are a hand-painted mix of traditional African art and contemporary designs inspired by the wildlife and surroundings in the breathtaking remote Luangwa Valley. The textile project was founded by a group of local Zambian artists in 1991 and has grown into a lucrative international business. 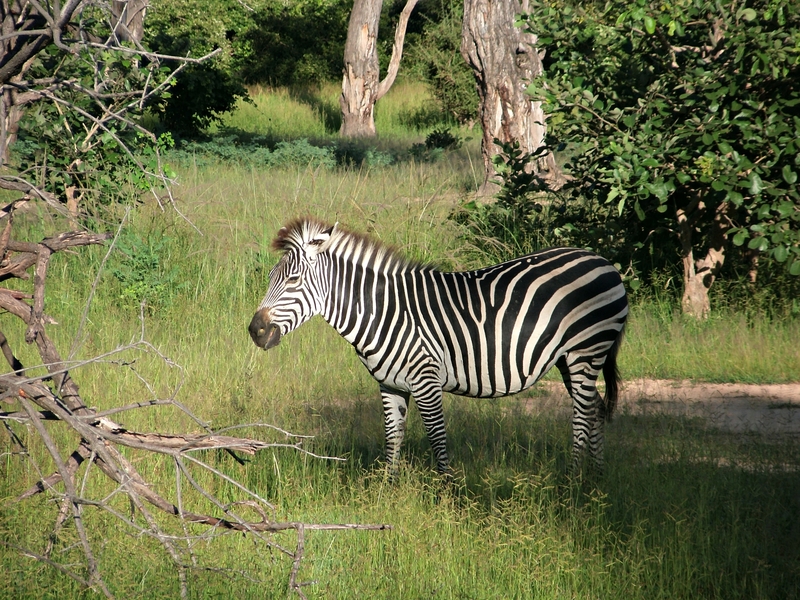 The magnificent textiles are works of art, but all I could think about was the park and another exciting game drive! We continued through the lush Zambian countryside to a point where the Luangwa River intersects the Zambezi River and forms a natural border between Zambia and Mozambique. 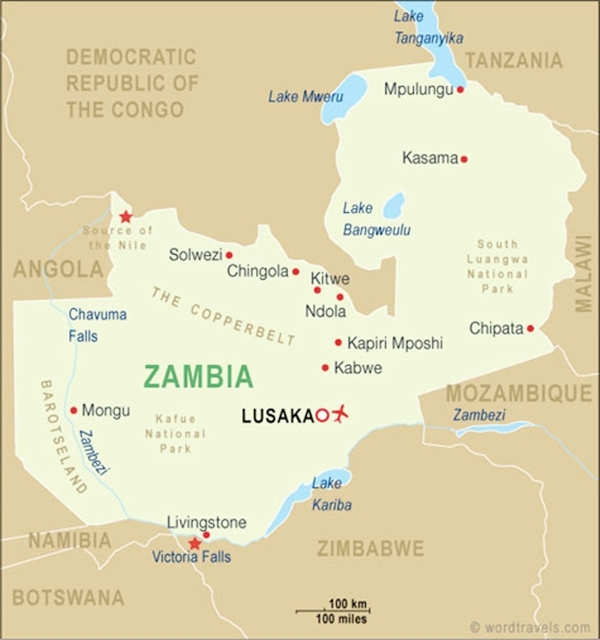 The Zambezi is the fourth longest river in Africa and flows through six countries on its way to the Indian Ocean. The bridge across the Luangwa River was heavily guarded and taking photos of the bridge or the armed guards is forbidden. The penalty is severe. Our guides explained this is for security reasons since the bridge is over a strategically important hydroelectric dam – Cahora Bassa. 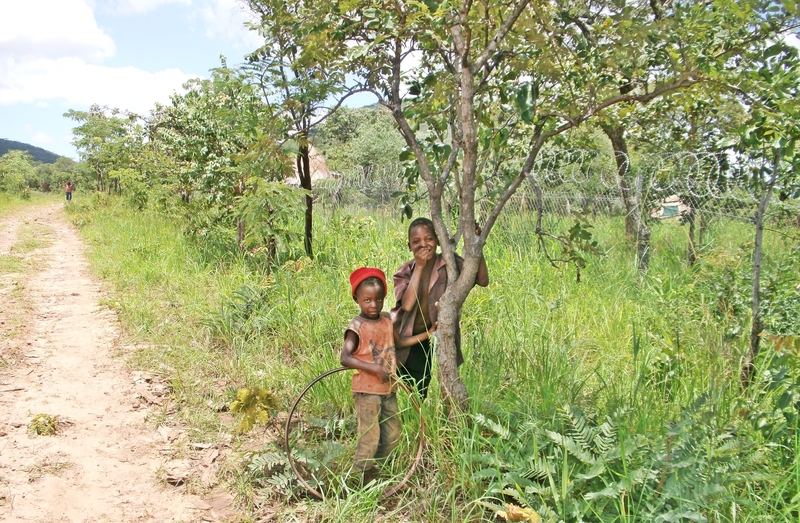 Recently there has been tension in Mozambique between opposition party militia (RENAMO) and state security forces. I’m educating myself on the situation. The news media reported armed attacks on vehicles, and warned of a terrorism threat. We crossed the bridge unscathed and reached our destination. Tired and sadly arriving too late for a night game drive, we enjoyed dinner and rested for the following day. 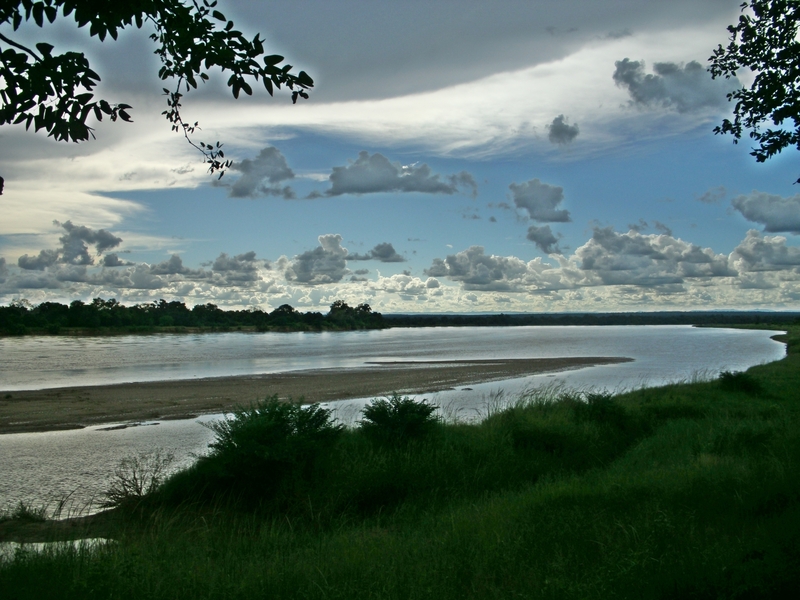 Our isolated camp was along the banks of the Luangwa River where we would be staying for the next two days. After so many one-night accommodations it’s comforting to hang your safari hat in the same place for two whole nights! The guides said we would see hippos and crocodiles on the riverbank and indeed we did! 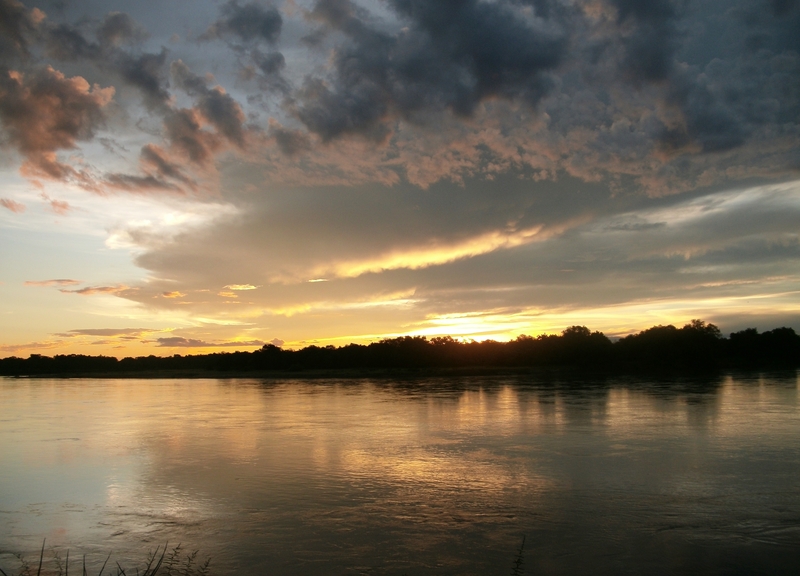 Everyone enjoyed a casual riverside dinner watching a spectacular Zambian sunset and listening to sweet African songbirds and base-sounding hippo grunts. We spotted a few sinister looking crocodiles scuttling along the riverbank. 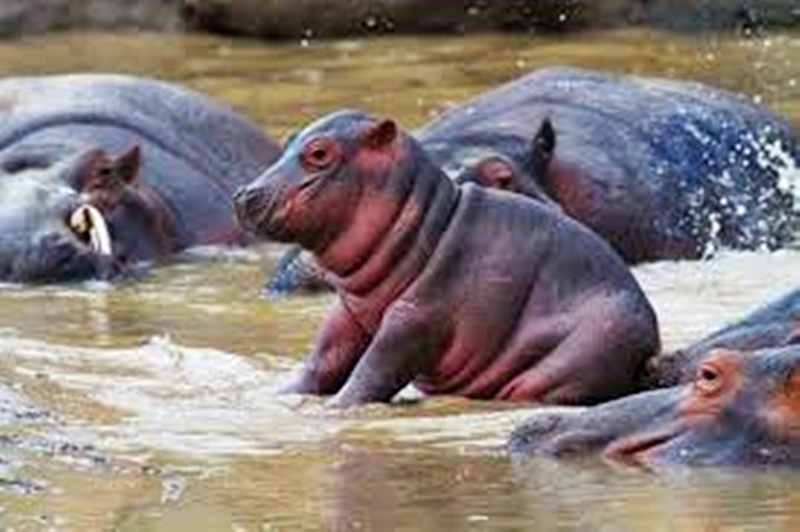 “Hippos are crucial to Luangwa’s ecosystem. When released into the river, their excrement fertilizes the water and supports the fish population which, in turn, sustains the crocodiles.” During the night when the hot sun isn’t beating down on them, lazy, sedentary hippos come out of the water to graze. 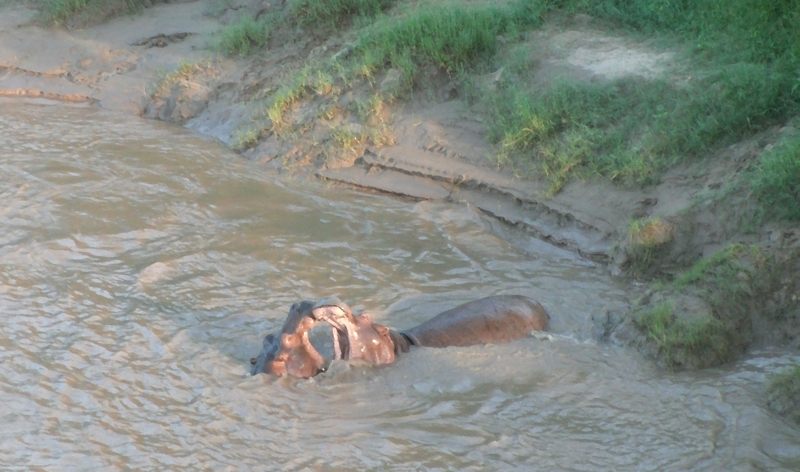 I was tired and fell into a deep sleep, but some in the group heard grunting hippos roaming our camp during the night. 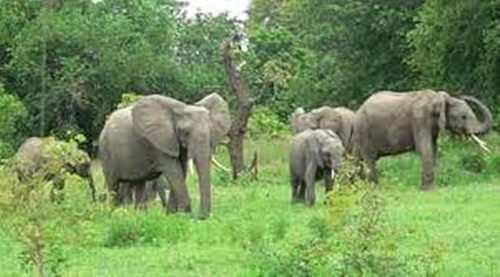 South Luangwa National Park is a world-famous wildlife sanctuary. 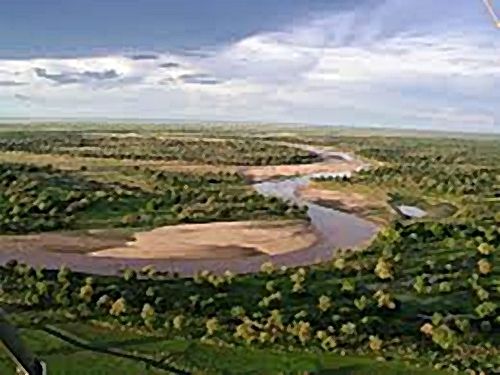 Declared a National Park in 1972, the Luangwa Valley became an established game reserve in 1983. It covers over 9,000 sq. kilometers (3,500 sq. miles). 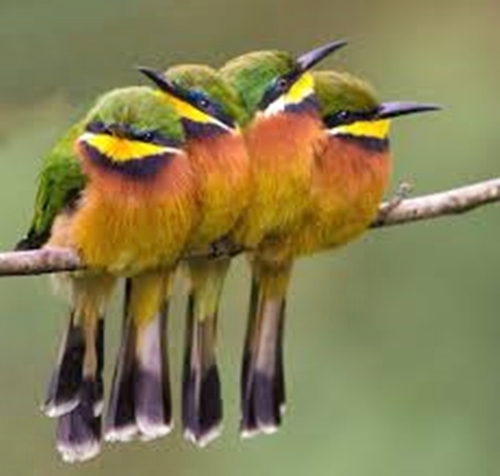 The Park has 60 animal species and over 400 different exotic birds, including fish eagles (Zambia’s national bird), bee eaters, lilac breasted rollers, Bateleur eagles, and many unusual stork species like the exotic, beautiful but endangered saddle-billed stork. 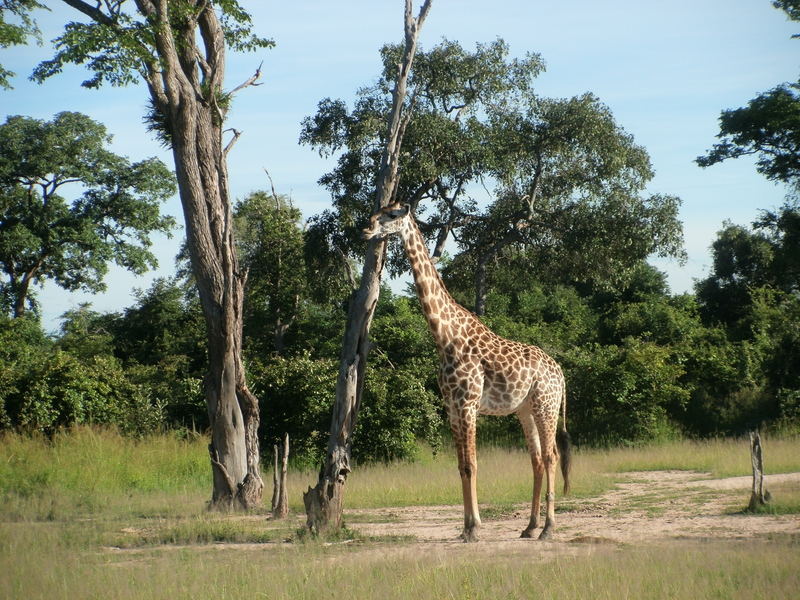 The park has large elephant and buffalo herds and a significant population of Thorneycroft Giraffe – a species endemic to the Luangwa Valley. A group of giraffes is called a “tower”. Beautiful, graceful giraffes have the best vision of any animal in the African bush. Coupled with their height they have the “greatest range of vision of any terrestrial creature”. South Luangwa National Park is said to contain the largest population of leopard throughout the African continent. 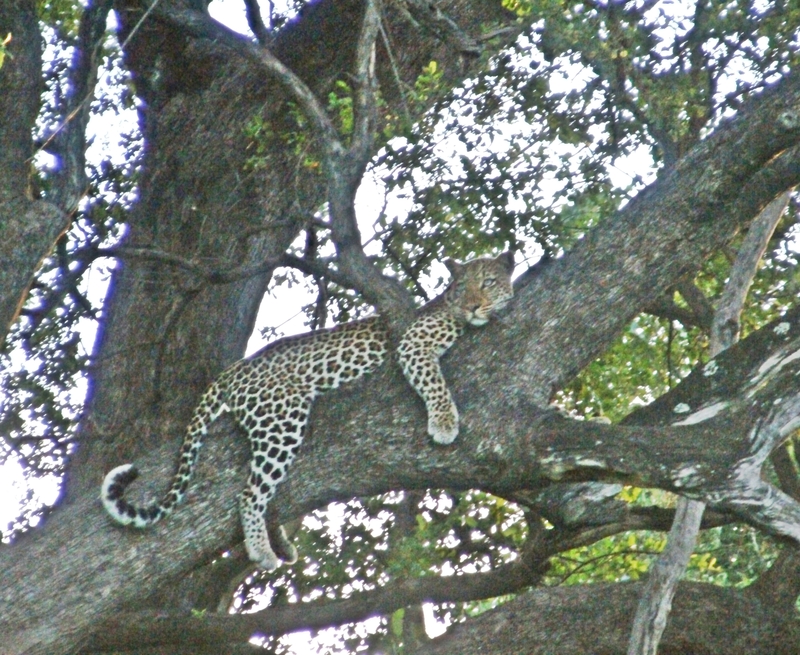 Park officials estimate that there is one leopard for every kilometer (0.6 mile) of river in the South Luangwa Valley. The area is called “the valley of the leopard“. 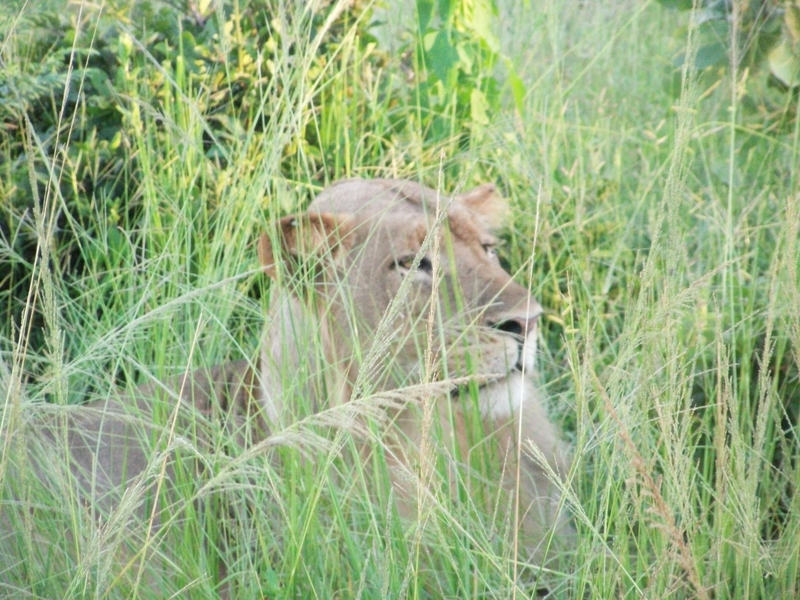 The early morning game drive was not included in the safari activity package, but it was well worth an extra fee. The vehicles used are open jeeps suitable for 6 or more in the back and 2 guides up front. There were only a few of us, so we sat close to the friendly guide who answered our questions. Game drives can last from three to five or more hours – depending on the terrain, photo stops, and the amount of game spotted. The morning game drive was mellow and memorable. We saw SO MUCH game including hippo, impala, zebra, giraffe, warthog, monitor lizards, wild dogs, crocodile, hyena, lions, elephant, buffalo, waterbuck, and many species of exotic birds! It was an incredible experience! One of the most exciting parts of the drive was our guide spotting an impala kill draped over a limb high up in a marula tree. Leopards are nocturnal, and they often hide their kill in trees and come back at night to eat when it’s dark and the meat has ripened. Our guide said we would return to the spot later during the night game drive and probably find the leopard returned to claim its kill. Every animal sighting was a precious, exciting experience but the two most unusual were a family of wild dogs and a huge herd of water buffalo. 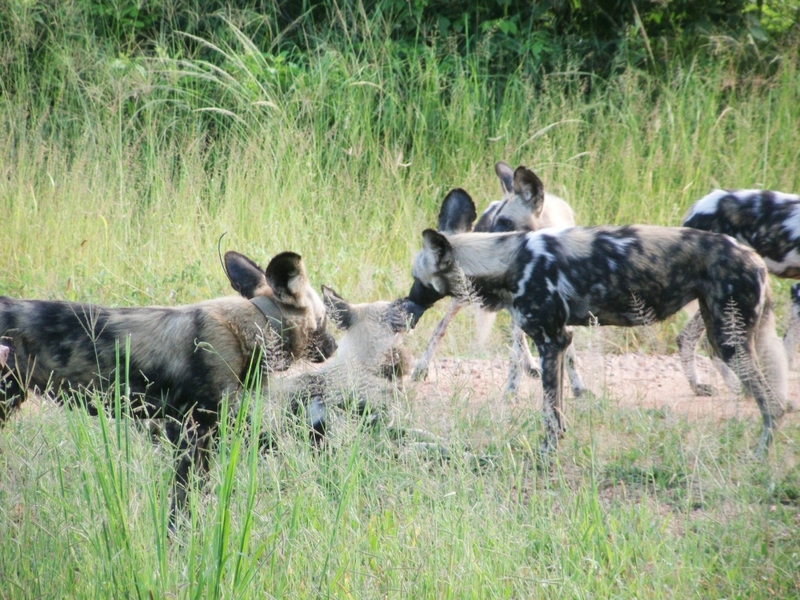 African wild dogs are an endangered species and our guides were surprised when we came across them – or rather, they found us…. The dogs were curious about the safari vehicle and came close to sniff around checking us out. We met a group of elephants and the dominant female didn’t like the jeep. She stood in front of our vehicle blocking the road, trumpeting, and raising her head in a threatening way. We were respectful, gave her space, and stayed quiet. When she started to charge us, the guides put the jeep in reverse and we high-tailed it out of there! 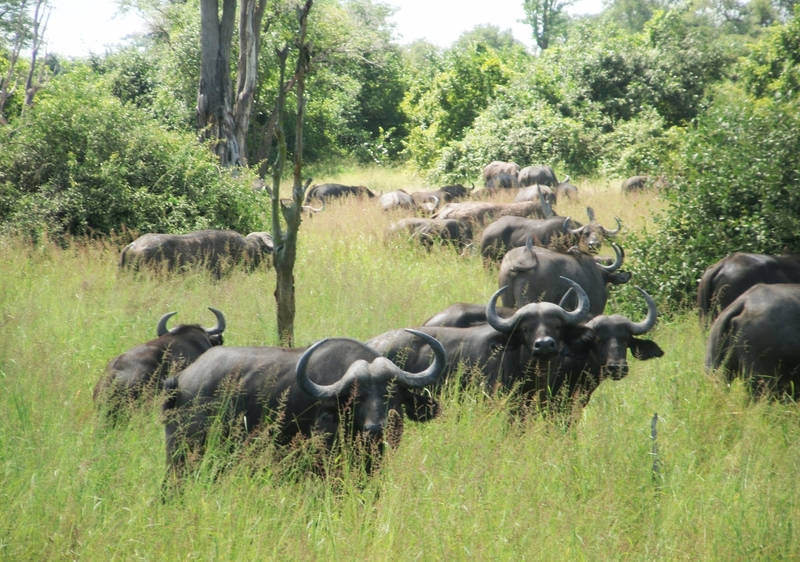 As we headed back to camp we discovered a large herd of water buffalo. 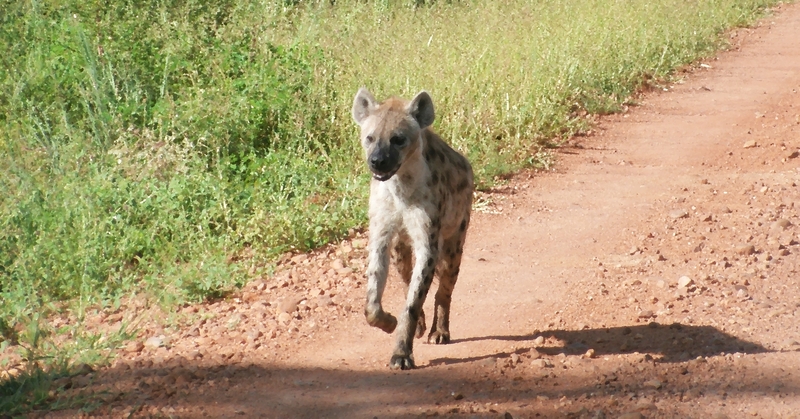 There were hundreds of them crossing the road moving slowly toward the Luangwa River! It was stunning seeing so many of these large magnificent animals in one place. The buffalo were curious and stood around the jeep staring us down and blocking the road! During the night game drive we returned to the scene of the leopard kill. Sure enough shortly after dusk we saw the leopard had returned and was waiting to devour its prize. It perched nearby in a big marula tree sprawled out over a limb watching us with an air of disinterest. In the soon to be pitch-black African night it was difficult getting good photos – or at least it was for me. A photo couldn’t do justice to one of the most beautiful animals in the world! More than one game drive a day can be exhausting. I think night drives are the most tiring, but there is no other way to see nocturnal animals like the leopard in their natural habitat. The guides use spotlights and find game by the light reflecting from their eyes. Since bright lights can be distressing and disruptive to animals, the guides soften the light by placing a red filter on the spotlight. Bugs are a big problem. There are so many swarming in the night air you need goggles or a face mask for protection. Even though we sprayed ourselves with insect repellent, we still ingested bugs through our eyes, nose, and mouth! As we left the park we saw a pride of lions stalking a herd of zebra. No one could tell if they made a successful kill. 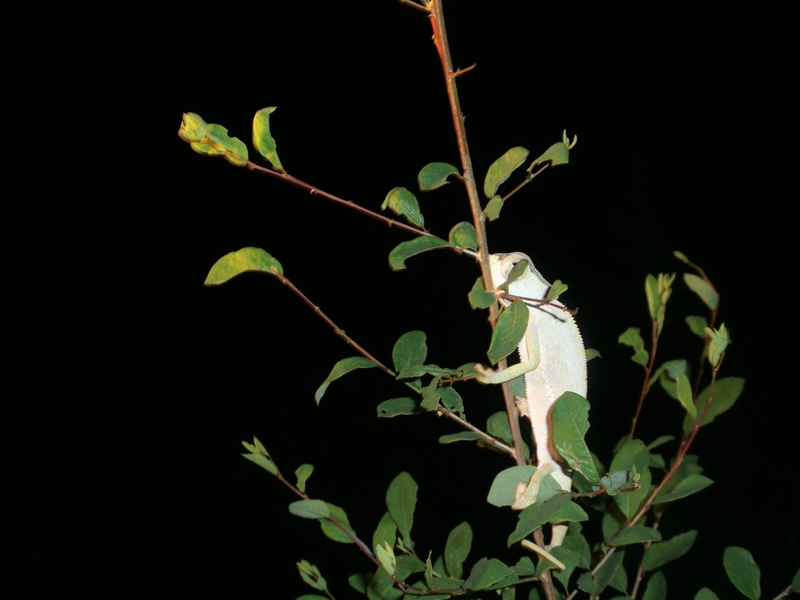 On the way home we spotted a little chameleon climbing a bush along the road. After a wonderful day we were sad to leave the animals but had to return to camp to prepare for an early morning departure to Malawi. More African safari stories later…. This entry was posted in Africa, Zambia and tagged African Safaris, Bateleur Eagle, Bee Eaters, Chipata, Elephant, Fish Eagle, Hyena, Leopard, Lilac Breasted Roller, Lilongwe Wildlife Centre, Lion, Luanga Valley Leopard, Luangwa River, Luangwa Valley, Lusaka, Lusaka Zambia, Marula Trees, Petauke, Saddle-Billed Stork, South Luangwa National Park, Thorneycroft Giraffe, Thorneycroft’s Giraffe, Warthog, Water Buffalo, Zambezi River, Zambian Artists, Zebra by suemtravels. Bookmark the permalink. Looks like you are having a fantastic adventure. Some wonderful shots and such a range of creatures, human too! Thanks – it’s been a little harder than I imagined getting settled in Cape Town but moving into a flat May 1st. The safari was something else and now reliving and experessing some of the days is a good mental exercise. Great photos! Thanks for sharing your extraordinary experience! Thanks May – revisiting the adventure is good and helping me get over this rough period of finding a place to live in Cape Town :( so much more difficult than I imagined. Enjoy Hawaii!!! Hope you can visit!